Save 25% off all closeouts at RideGear.com! Enter coupon code: 25CLOSEOUT at checkout. Triumph are aiming to celebrate the 50th anniversary of it's Bonneville motorcycle by producing two unique one-off designs. The designs will come from the collaboration of Ewan McGregor and the UK based designer of high-end motorcycling fashion, Belstaff. Ewan McGregor leaped to motorcycle fame with his worldwide motorcycle trip documented in 'Long Way Round'. Not content with his efforts, he followed it up with a ride through Africa alongside his long time freind Charley Boorman titled not very originally "Long Way Down". Creating a design which incorporates a copper-plated tank, and a black waxed cotton by Belstaff on the seat and side panel, harks back to what Ewan considers the Bonneville’s rich heritage. It's also inspired by one of the vintage bikes in his own stable, as well as his fanatical admiration of the legendary motorcycle icon (and Triumph rider), Steve McQueen. 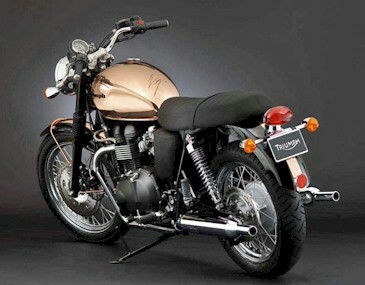 “I wanted to use a traditional waxed cotton material as it has such a resonance with the history of style in motorcycling and mix it with the tradition of coppering tanks," Ewan says, "I am a huge fan of Steve McQueen and his films from the 1960s, and the font that I have chosen for the Triumph logo harks back to that golden era of biking." Belstaff, one of the the leading innovators in the motorcycling fashion industry, is also producing a custom design of the Bonneville which includes a very dapper black and gold color scheme, with a gold seat cowl and a black and gold set of panniers. Since clothing seems to go hand in hand with the motorcycles themselves nowadays, Belstaff is also creating a limited-edition motorcycle jacket to mark the anniversary. The Belstaff limited-edition designed Triumph Bonneville will be on display in Belstaff’s flagship stores in London’s Conduit Street, as well as Rome and Milan and available for purchase exclusively in selected stores worldwide later in 2008. Ewan McGregor’s one off bike will be auctioned for his chosen charity, UNICEF for whom he is an ambassador. Further details regarding the auction will be released shortly.